For Dylan Weitzman and Brandon Carpenter’s company, Thor ORE, the third time was the charm. 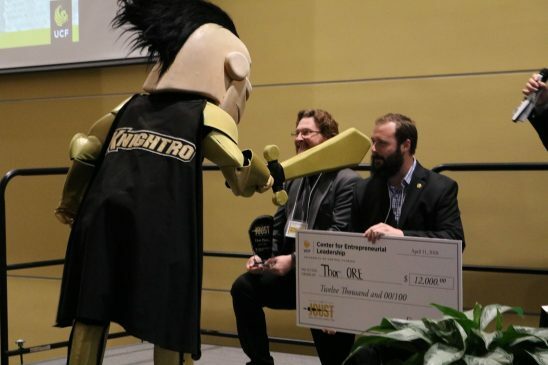 After three years of applying for the UCF Joust New Venture Competition and failing to reach the final round, Thor ORE beat out the competition Wednesday to take home first place, a $12,000 check and more than $50,000 in business services. On a Shark Tank-style stage with a panel of professional judges and in front of a live audience of more than 200 people, UCF senior Weitzman pitched his plan to mine and recover precious metals from contaminated lands and waste. The two co-founders have collectively competed in dozens of entrepreneurship competitions and their persistence is what they believe sold the panel of expert judges on Thor ORE’s business model. Weitzman and Carpenter plan to use the competition winnings to expand Thor ORE’s mining operation in Alabama. The company’s appeal, according to Carpenter, lies in its proprietary extraction technology, which allows for eco-friendly mining of smaller, previously inaccessible amounts of gold. The Joust is UCF’s premier startup showcase event hosted by the UCF College of Business’s Center for Entrepreneurial Leadership and featuring students of all majors. This year’s event was held at the Morgridge International Reading Center on campus. Competitors present their models for a viable business venture and compete to win money and other resources to pursue their venture. Ford said the judges pointed out how viable each of the competing proposals could be and commented on the excellent level of preparation by every student involved. The Joust runners-up were Mason Mincey, Derek Saltzman, Gerardo Diaz-Silva, Garrett Hausman and Matthew Jaeger with SOAR Aerospace, a company that produces sleek, stylish, customizable and quality high-speed drone frames. They took home $7,000. Shane Singh, Shi Hao Zhang, Akash Gajjar and Shivkumar Kaushik Murthy earned third place and $4,000 for their company, S Star Technologies, and its state-of-the-art respirator. Miracle Care Responders and the team of Jean Saint Jean and Ladeen Taylor ranked fourth for their idea to train, license and find jobs for Certified Nursing Assistants. They took home $2,000. The students’ new-business-venture proposals were assessed by a panel of expert professionals representing a wide range of corporate partners, local businesses and alumni. This year’s judges were Carrie Callahan, ’94, managing partner at Galliard Capital Management; Sean Hayes, ’95, vice president of Business Development at Voloridge Investment Management; Mathy Hogan, ’87, executive vice president of administration at FAIRWINDS Credit Union; Charles Jorge, ’89, president and CEO of Premier Assurance Group; Patrick Vaughn, ’80, co-founder of Trivium Asset Partners, and Vince Virga, ’95, co-founder and CEO of SkillStorm. This year’s presenting sponsors were Steve Felkowitz ’79, Jim Balaschak ’86 ’92, and Debbie Balaschak ’88. Additional sponsors included Burr+Foreman, DigiThinkIT, Anidea Engineering Inc., BDO, Nperspective LLC and Volo Foundation.